Delivery by post to EU countries ONLY 9.60Eur! Extravagant inlay sweater with star pattern and glitter highlights. Flattering cut, round neckline and rib knit hems. Length approx. 64cm. Soft, comfortable fine knit, 58%viscose, 38%cotton and 4%metalized fibre. Trendy rough knit cardigan in open cut. Flattering cut, round neckline. Two pockets and long raglan sleeves. Rib knit sleeves. Length approx. 64cm. 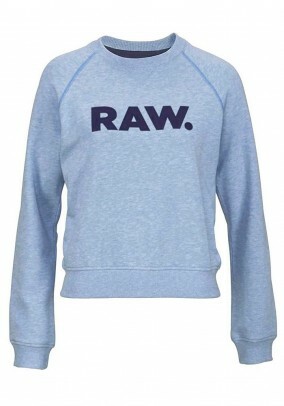 Comfortable knit quality, 60%cotton and 40%polyacryl. Extravagant, detailed knit look with effect- and glitter threads plus amazing pattern mix in striped look. Figure-hugging cut, round neckline, covered press stud border and long sleeves. Length approx. 58cm. Knit quality, 43%polyacryl, 37%polyamid, 19%cotton, 1%metalized fibre. Casual knitwear cardigan with ribbon yarn and knit pattern. Flattering cut, round neckline. Two pockets and long sleeves. Front buttons. Added length from size 44. Length from 56 to 62cm. Comfortable knit quality, 72%polyacryl and 28%polyamid. Fine cardigan with structure and flattering silhouette. Round neckline, comfortable 3/4 sleeves and rib knit hems. One button. Length approx. 58cm. Comfortable fine knit structure, 96%viscose and 4%polyamid. Trendy, attractive print and shimmering rivet trim in heart shape. Flattering cut, wide V-neck and 3/4 long sleeves. Longer in the back, rounded hem. Length from 66 to 73cm. 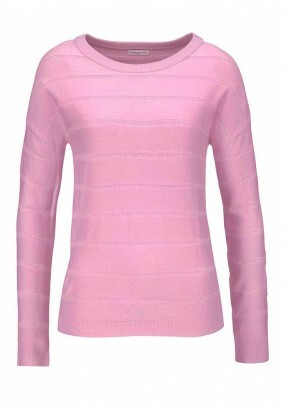 Comfortable rib knit quality, 65%polyester and 35%viscose. Eyecatching crochet pattern mix with casual details.Flattering sweatshirt with wide round neckline, 3/4 long sleeves and flounced. Figure-hugging jersey top with spaghetti straps. Sweatshirt length approx.56cm. Top length approx. 59cm. Comfortable crochet knit, 100%cotton. Top 100%viscose. Classic sweatshirt with ribbon yarn in netwear look. Long sleeves with drawstring and elastic cord with silver coloured stoppers on the hem. Flattering cut, round neckline, oversize shoulders. Length approx. 60cm. Strong, semi transparent quality, 100%polyester. Casual chic! Refined striped look with lurex threads for sparkly accents. Flattering cut, wide rounded neckline, long sleeves and ribbed hem. Length approx. 60cm. Soft fineknit quality, 40%polyacryl, 40%cotton and 20%metalized fibre. Casual brand style sweater. Stand-up collar with cord. Flattering cut, light stripe print on the sleeves, logo print on the front, long sleeves with hems. Overlock seams, logo details on the cord. Length approx. 61cm. Soft sweat quality, 55%polyester and 45%cotton (supports Cotton made in Africa). Detailed, charming fine knit cardigan with eyelet embroidery parts. Gold coloured buttons. 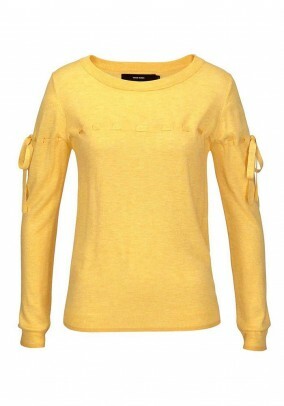 Figure-hugging cut, ribbed round neckline, full button border and long sleeves. Length approx. 54cm. High quality material mix, 80%viscose and 20%polyamid. Refined basic in fresh, fun colours. Soft fine knit sweater with decorative tie on the sleeves. Flattering cut, wide ribbed round neckline, long sleeves and rib knit hems. Length approx. 58cm. Soft fineknit quality, 60%polyester, 25%viscose and 15%nylon. 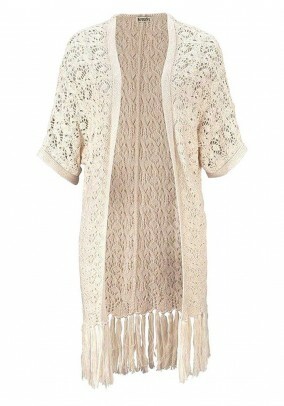 Casual maxi knit coat with eyelet embroidery pattern and fringes. Open cut, short wide kimono sleeves. Length approx. 92cm. Soft rough knit quality, 50%cotton and 50%polyacryl. Extravagant cardigan with jewelry included. Short cut, contrasting applied pearl chain along the edges. Rounded hem. Long sleeves. Length approx. 49cm. Comfortable fine knit quality, 50%cotton and 50%polyacryl. Knitwear meets pink! Eyecatching decollete with cut-outs below the neckline, short sleeves with rib knit hems. Flattering cut, ribbed round neckline and rolled hem. Length approx. 68cm. Wonderful soft fineknit quality, 92%viscose and 8%polyester. 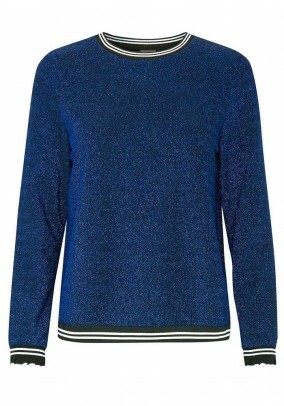 Casual sweater with shimmering metalic effects. Flattering cut, round neckline, long sleeves and striped rib knit hems. Sleevehems in ruffled look. Length approx. 60cm. Comfortable quality, 65%polyamid and 35%polyamid. Refined fine knit sweater with ajour pattern knit in striped look. Flattering cut, ribbed round neckline, oversize shoulders and rib knit hems. Length approx. 56cm. Wonderful fine knit quality, 100%acryl. 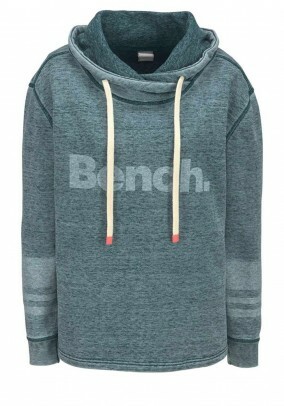 Cool, casual sweatshirt in sportive look with logo print on the front. Flattering short cut, ribbed round neckline, long sleeves and rib knit hems. Small logo badge on the side. Length approx. 54cm. Comfortable sweat quality, 85%cotton and 15%polyester. Ribbed hems 98%cotton and 2%elastane.